Optimizing turbofan designs is challenging because of the need to deal with both aerodynamic and structural performance. While designing a fan with high performance and efficiency is important, strength and reliability of the structure are also critical. Further, integrating parametric CAD, CFD and stress analysis is not a trivial task and usually takes extensive effort. In this project SmartDO and ANSYS were utilized together to optimize a turbofan. 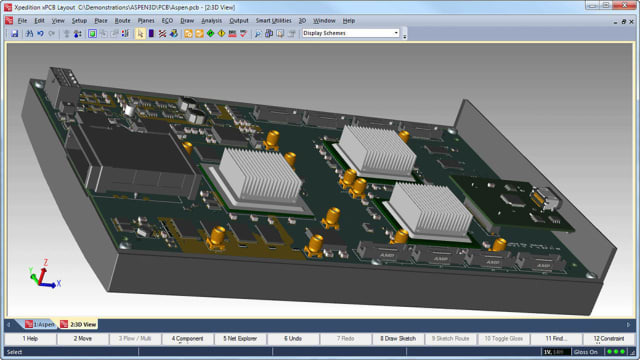 The technical services team at SmartDO’s developer, FEA-Opt Technology, helped the customer build a parametric model with ANSYS DesignModeler, construct the CFX and mechanical analysis block, and integrate SmartDO with ANSYS Workbench. SmartDO was able to increase the mass flow of the fan by almost 14% while slightly reducing the maximum stress under aerodynamic and structural loading. These results showed promising possibilities for further design development. Building integrated CAD/CAE workflow with ANSYS Workbench—The turbofan model was built using legacy data from an existing product that had been in service for years with proven reliability. The goal of the new project was to improve aerodynamic performance without sacrificing blade strength. ANSYS DesignModeler (DM) was invoked to rebuild the parametric CAD model of the fan with help from FEA-Opt Technology. The result was a CAD model with approximately 90 meaningful controlling parameters, which was able to fit the existing design accurately. The DM model was then linked with the CFX and mechanical analysis block to form a complete CAD/CAE workflow. The Parameter Set list in ANSYS Workbench can be linked directly with SmartDO/SmartLink to perform design optimization directly. Defining the optimization task with SmartDO—Although there were approximately 90 design parameters in the model, the customer’s experience led it to focus on airfoil sectional shape at the tip, middle and root of the blade. Also, some key design variables were considered more important than others, namely (1) attack angle and curvature of the airfoils, which govern aerodynamic performance, and (2) thickness distribution of the airfoils, which governs their mechanical properties. Design variables: Attack angles, curvatures and thickness distribution of the airfoils (total of 9 independent design variables). Objective: Maximize the mass flow under specific rotational speed. Maximum stress should be lower than the original design. Radial displacement should be lower than the original design. SmartDO global optimizer provides promising improvement—The optimization problem was solved by SmartDO and ANSYS. Using its global optimizer, SmartDO was able to overcome the local minimums to produce a new design with 14% increase in mass flow, and with maximum stress slightly smaller than in the original design (reduction from 1884MPa to 1820MPa). The figure below shows the stress distribution of the initial and optimal designs. The radial deformation was reduced from 3.5mm to 3.0mm. The three figures below show the comparison of pressure distribution on the airfoil at root, middle and tip sections. Finally, the figure below shows the comparison of airfoils at different sections. While further study remained to arrive at the final product design, the optimized results from SmartDO showed promising improvement over the original design, demonstrating the significant ROI from utilizing optimization technology on the project.